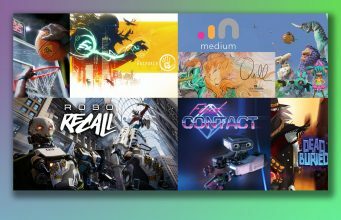 The launch of Oculus Touch is just around the corner, and while the company says there’s a day-one launch lineup of more than 50 titles, your Touch pre-order will grant you access to at least seven pieces of free made-for-Touch content. Much ado has been made of the two games bundled with Oculus Touch pre-orders, but you’ll actually unlock seven solid pieces of free content if you pre-order Touch (or five without pre-orders) which will keep you busy for a while before you start dropping cash on the Oculus Store. First Contact is Oculus’ introduction for new Touch owners, similar in scope to Oculus Dreamdeck for the Rift itself. It’s a short demo-like experience that immediately follows the controller configuration and tutorial. In it, you’ll find yourself in a retro-future setting in the presence a friendly robot. It’s no Toybox, but the beautifully rendered and detailed experience will have you playing with plenty of toys as you learn how the controllers let you naturally interact with the virtual environment. Dead and Buried is a multiplayer-focused Touch shooter featuring versus and co-op gameplay for up to four players all wielding badass weaponry in the game’s supernatural-western style. The title was developed in-house by Oculus. Another first-party app from Oculus, Medium lets you sculpt 3D content in real time, as if you were shaping virtual clay. The program is more of a tool than a game, but gives users a way to create truly unique works of art inside of VR. Another first-party creation-focused app from Oculus, Quill is more about illustration and storytelling than Medium which is more focused on 3D modeling. Quill was created by Oculus Story Studio, the company’s VR film division, as the visual foundation behind the forthcoming Dear Angelica. Quill looks similar to the Vive-exclusive Tilt Brush, though Oculus says the app is about illustrative storytelling, so we hope to find tools included which make it easy to form a narrative out of the VR sketches. Epic Games is turning their much-praised Touch demo, Bullet Train, into a full title, Robo Recall, that will be released for free to Touch owners in Q1 2017. It it you’ll be looking to “recall” “damaged” robots run amok, using an array of satisfying weaponry and fun mechanics like being able to rip robots limb from limb and throw their own bullets back at them. The Unspoken, by Insomniac Games, is a unique magical dueling game that pits Touch users against each other in 1 on 1 combat. With several magical classes to chose from, you’ll use buttons and gestures to cast spells to thwart your opponent. VR Sports Challenge is all about putting the player in the most fun moments of popular sports. Between football, hockey, basketball, and more, you’ll find yourself doing a series of thematically connected mini-games, some of which can actually work up a good sweat. The post Here’s All 7 Pieces of Free Content You’ll Get With Touch appeared first on Road to VR.